Share this product and receive a $1.62 sharing discount. 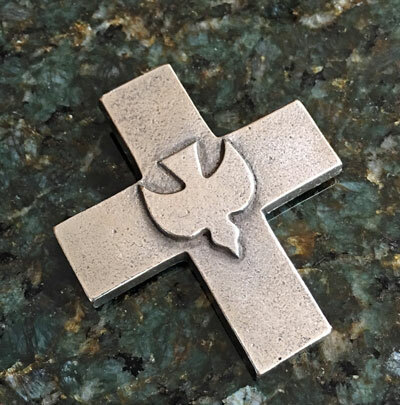 The Holy Spirit Cross with Dove is a sleek and radiant small wall cross that is an ideal Confirmation and adult Baptism/RCIA gift. The Holy Spirit Cross is hand-crafted in Europe, using the finest bronze available, which is then given the silver-nickel finish. It is about 3 inches square, and features an eyelet that allows it to be mounted on any wall. The cross is especially versatile because of its small size and silver-nickel finish. The texture provided by the finish gives this piece an organic, earthy feel that makes it well-suited to being framed because of its symmetry and bold symbolism. The simplicity of this piece is the source of its symbolic power. Because of the silver-nickel finish, the cross is pleasing to gaze upon, and it makes a simple yet powerful addition to whatever room you place it in. 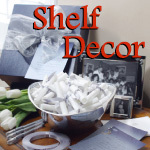 It is especially well-suited for dorm rooms because of its small size, which makes it a great gift idea for young people just heading off to college as well. This is one of the crosses in our collection with just about universal appeal, so it makes a great gift for anyone who is going through any of the sacraments or anyone who just wants a reminder of the grace and power of the Spirit. This bronze cross (silver bronze) is an ideal gift for all Sacraments, especially Confirmation and adult Baptism.